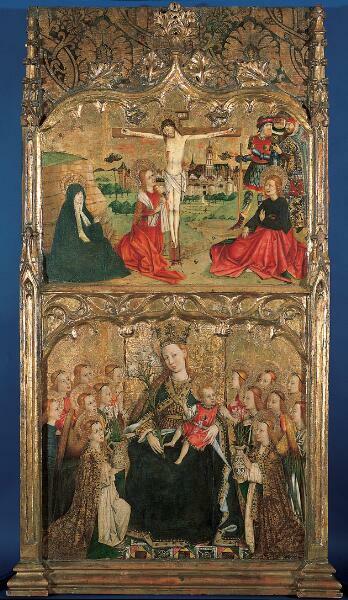 Juan Rexach was one of the most important fifteenth-century painters in Valencia. His work, while firmly Spanish, contains elements from other artistic centers in Europe, particularly Flanders. The crucified Christ is painted in a style that is reminiscent of Gerard David, and the distant architecture is Northern in origin. The beautiful and typically Spanish composition of the Madonna and Child enthroned with angels became a popular subject in Valencian painting of the period. Fortunately, the late Gothic ogee arches above each compartment have been preserved. It is clear from the framing and arrangement of subjects that this must have been the top central section of a large retable. Brought to [?U.S.A.] from Valencia in the 19th or early 20th century. Grace Nichols (later Mrs. Richard P. Strong), Boston, by 1928. Mr. and Mrs. John G. Greene, Boston, by 1961. This magnificent panel by the 15th-century Spanish painter Juan Rexach probably belonged to a late Gothic retablo, or altarpiece. It depicts scenes from the life of Christ and the Virgin Mary, rendered in a crisp, meticulous style that suggests Northern European influences. In the lower panel, the Virgin Mary is enthroned and surrounded by angels. The white lily she holds symbolizes her purity. She looks directly at us, as the infant Christ plays innocently on her lap. Her embroidered robe and jeweled crown, enhanced by copious amounts of gold leaf, underscore her regal presence. The top painting shows the crucifixion of Christ. On the left, wrapped in a nun’s dark mantle, the Madonna witnesses her son’s death in silent agony. Gazing up at the cross, in a luminous red dress, is Mary Magdalene, the sinner who repented and became Jesus’ devout follower. On the right, the apostle John weeps quietly, while guards look on. Both scenes are embellished with punchwork, tiny indentations hammered into the surface, decorating the halos and forming a meandering grapevine beneath the gilded arches. The arrangement of the arches and spires suggests that these paintings may have formed the top central section of the altarpiece. The wings probably showed saints or other biblical scenes, intended to stir piety and compassion in the worshipper.